Yeine Darr is an outcast from the barbarian north. But when her mother dies under mysterious circumstances, she is summoned to the majestic city of Sky – a palace above the clouds where gods’ and mortals’ lives are intertwined. There, to her shock, Yeine is named one of the potential heirs to the king. But the throne of the Hundred Thousand Kingdoms is not easily won, and Yeine is thrust into a vicious power struggle with a pair of cousins she never knew she had. As she fights for her life, she draws ever closer to the secrets of her mother’s death and her family’s bloody history. But it’s not just mortals who have secrets worth hiding and Yeine will learn how perilous the world can be when love and hate – and gods and mortals – are bound inseparably. 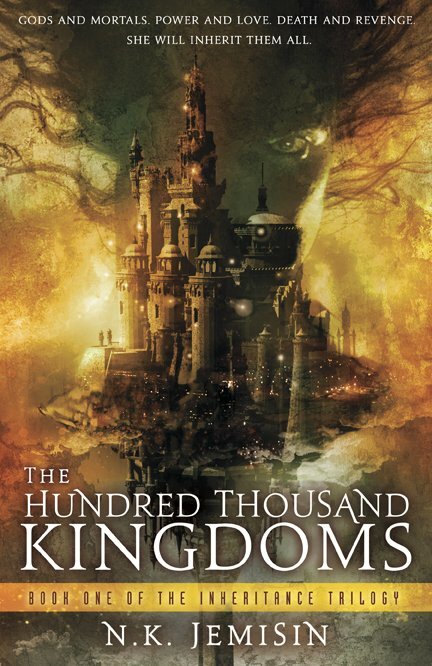 Why Did I Read This Book: I think I do not exaggerate when I say that The Hundred Thousand Kingdoms is one of the most highly anticipated reads of 2010 in the Fantasy metier. Then the reviews started showing and they were very positive. Even with all that, I was not prepared for how GOOD this book turned out to be. It says a lot about me, as a reader, that I read those first few lines and am immediately hooked. I think to myself: is Yeine protagonist and first person narrator of this story, a reliable one, if she is trying to remember the story she is about to tell? I am therefore, engaged in her tale from the beginning, because unreliable narratives happen to be one of my favourite narrative styles. Thus, I am comfortable in my belief that I know what the author is doing and the chapters pass me by and I am slightly disappointed because well, if there are no surprises, where exactly is this going? But then, the slow realisation that: no. I do not know exactly what she is doing. I was wrong, what she is effectively doing is even better. I go back to the beginning. I re-read the two first chapters. It is a different story now. It says a lot about N K Jemisin, as a writer, that I am now, more than engaged. I am committed to this story. There is a rapport between this book and I that is a direct consequence of the mix of elegant writing, fascinating story and awesome characters. But I think I am ahead of myself. Young Yeine Darr, is summoned by her grandfather after her mother’s death to the floating city of Sky, the seat of the powerful Arameri, the family that controls the Hundred Thousand Kingdoms. To her dismay, she is named heir and is on the run for the Succession which is to happen in a couple of weeks. It is a wild competition against her two cousins which might well end up in death. Coming from the “barbaric” North, where she was the head of her matriarchal tribe, a position she has to relinquish once she leaves for Sky, Yeine has to learn (and fast) the rules of Sky, adapt to the political intrigues and to basically learn the ropes of the Arameri culture. Part of it means to understand how every single inhabitant of Sky is a member of the Arameri family only to different degrees : Quarter, Half-Bloods, Full Blood. The lowest from the top are servants and the Full Bloods like Yeine and her cousins are the top dogs. And in charge of the Weapons. And here is where things get really interesting. Once upon a time, there were three Gods. The Nightlord (or Nahadoth) who came first; Bright Itempas , the god of day, and Enefa, the goddess of twilight and dawn. Or light and darkness and the shades between. Or order, chaos, and balance. The three Gods were siblings and lovers in what can be called the most beautiful and yet terrifyingly sad story ever. Falling out. Death. Betrayal, Enslavement. The outcome is this: Enefa is dead, Itempas is the sole remaining God, the Skyfather worshiped by the Hundred Thousand Kingdoms. The ancestors of the Araremi were his devoted priests and in reward they were given the weapons: Nahadoth and three of his Godling children, entrapped and enslaved in (somewhat) human vessels controlled by any Highblood who dares to (because there is a catch – any command you give must be very carefully phrased as the Gods tend to take them very literally). Still, weapons they are, hence, the power the Arameri hold all over the world. Who would stand up against a family who wield the power of Gods? And there comes little Yeine. Whose motivations are much different than expected. Revenge. Because her mother was killed and who killed her? Inheritance is the least of her concerns. And then the novel is a murder mystery: because she wants to learn who her mother is and why she left Sky in the first place, why the falling out with her father? But Yeine is not the sole protagonist of The Hundred Thousand Kingdoms. Oh, no. She shares it with the Gods: Nahadoth and his son Sieh (the trickster or the eternal child). And then the story has yet another layer: as Yeine is caught in the middle of the Gods’ scheming against their oppression. It might come as a surprise the use of the word “oppression” in the same sentence as “gods” but this is exactly the extent of the ruthlessness that the Arameri family has come to. The horrible torture that the gods must endure is tremendous. For two thousand years these beings have been shaped and limited by human forces. The Hundred Thousand Kingdoms is basically the story of two very dysfunctional families. On one side, the Arameri is the cautionary tale of the maxim: that absolute power corrupts absolutely. Not only does that apply to the enslavement of the gods and peoples of the world, it also applies to a day-to- day life and fundamental relationships with others. Everybody is expendable in their pursuit for power. On the other side, the cosmic Family: Itempas, Enefa and Nahadoth. In this mythology created by N K Jemisin, there is a mixture between concrete and abstract that is very interesting. These gods are both representations of ideas and nature forces such as chaos, balance and order; heat, cold, change; day, night, dawn, life and death but also very tangible, concrete, human emotions like hate, lust, love, fear. Bearing in mind that humans are their creations, it is almost like their own mirrors: with all the grandeur but also all the pettiness. The only difference is that when any of these things are felt by a God, the cosmos feels it too. This concrete x abstract occur even as Nahadoth talks to Yeine: sometimes looking at him is like staring into an abyss sometimes he is much humanised. And in the middle of it there is Yeine. Not entirely Arameri, not a God. She is the most human character of them all: when she realises she might not survive her own story, she cries for hours, a very human reaction and one I deeply commiserated with. Her position is a very complicated one. Unused to diplomacy, used to situation when the drawing of a knife is the best way to deal with it, sometimes she is utterly incapable of making any move at all. But she adapts and in this adaptation, she reinvents herself. I thought Yeine to be a very sympathetic protagonist. And it is because of this humanity, that she dares hope for a romantic relationship with Nahadoth (he might be the God of change and chaos, but he is also the God of seduction) and those who tried in the past millennium have not survived the deed for a myriad of reasons best left for the reader to discover but is all part of the complexity of who Nahadoth is. It doesn’t surprise me the least that Yeine has fallen in love with him because I have too, a little bit. This is a larger than life character – consider this: a supreme being, the first ever living being in the universe cursed to live like a lowly slave. And yet, he still has the capacity for tenderness because after all he is the God of change (and adaptation). The novel has its fantastic characters and a great plot and that includes the romance thread as well. But it goes beyond that. It is a very emotional novel, and I went through a broad range of emotions while reading it: fear, rage, hate, compassion, sadness, lust; and finally, there was the writing. It felt very welcoming. I don’t think I ever used this word to describe someone’s prose but that is exactly how I felt, as the author eased me into a story that started thousands and thousands of years ago like I was just there. All the different layers of the novel intertwine to a very satisfactory self-contained ending. And when I closed this book, I realised that the author did something to me, broke my mind open and torn out my heart several times throughout the book, but in the end I knew exactly who I am. A fan. And I didn’t even tell you half of it. Another tale from my childhood occurs to me here. It is said the Nightlord cannot cry.No one knows the reason for this, but of the many gifts that the forces of the Maelstrom bestowed upon their darkest child, the ability to cry was not one of them. Enefa of the Earth could cry. Her tears took the form of the yellow, burning rain that falls around the world after a volcano has erupted. It still falls, this rain, killing crops and poisoning water. But now it means nothing. Nightlord Nahadoth was firstborn of the Three. Before the others appeared, he spent countless aeons as the only living thing in all of existence. Perhaps that explain his inability. Perhaps, amid so much loneliness, tears become ultimately useless. Verdict: Damn Near Perfect debut novel that is a great blend of fantasy and romance, religion, mythology, politics, gender and race. The writing is lovely, the plot is superb (with a few surprises) and the characters made a hole in my heart the size of a volcano. The only thing that can fill it now is book 2. This book sounds really, really good. *updating wish list* Thanks for the review. ? I am so glad you loved this booK!!! I pre-ordered it after reading the excellent reviews from PW, Kirkus and Library Journal, but I never really trust that a book is great until I’ve read the reviews by the bloggers I love. So, yay! Unfortunately, my copy doesn’t ship until the 25th. According to the author’s site, it will be available in stores as early as tomorrow! So excited to see a review for this one! I really want to read it, and I’m so excited that it is based on Hindu beliefs, or the more ancient religions in which gods were so involved. I’m really looking forward to getting my hands on this! I realised that the author did something to me, broke my mind open and torn out my heart several times throughout the book, but in the end I knew exactly who I am. After reading your great review, I went to Amazon to buy the book and it’s not available till 2/25/10. I was a little upset and pre-ordered it and I am anxious to read it. I need help….cuz I still went to the store and got a book anyway. With such a review, no wonder I’m definitely interested ! Great job ! Apparentely, the author says early copies have been spotted already! The cover is absolutely stunning!! Beautiful review, I am so buying this when I next go to the bookstore, thanks! 😯 This looks fabulous. Thanks for the review, Ana! What a beautiful review! I think the best thing about being a fan is turning other people on to an author’s work, but the ability to be expressive really helps. I’ve seen this book mentioned dozens of times, but I never wanted to read it until now – and now I can’t wait! Thank you. 😀 Ay carumba! What a review! I’ve got this on my wishlist already, but you just made me want to read it even more! Gnashing teeth waiting for this one to come out … so happy to hear that it lives up to (exceeds?) the hype! Smashing, I must in future try to read it – and I’m so excited that it is based on religious beliefs, or the more ancient religions in which deities were included. That was a beautiful review to go along with an amazing book. I’m completely in love with this story and can’t wait until the 2nd book comes out!!! i’m in the middle of this book now, and *loving* it.